If you know me, and since about 3 people read this blog I’m assuming you do. You’re probably staring at this post title in horror. Chrystie, the self-professed “I wouldn’t eat a salad if you paid me” salad hater making a salad post!?! Relax and please take note of the “Big Mac.” This is taste bud fun disguised as a salad. I’ve always considered myself a healthy eater, subscribing to the thought of everything in moderation and splurging rather that sacrificing. But, when I eat something healthy I want to eat something good. I’d rather eat less of something fulfilling, than more of something masquerading and ultimately leaving me unsatisfied. 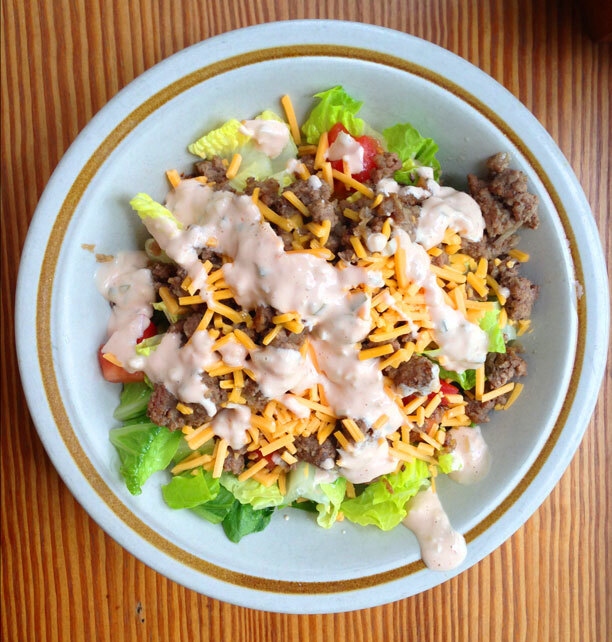 It’s hard to find something that fits both criteria but this salad does it. Oh and it falls in at under 500 calories, if you’re into that sort of thing. Source: The very creative Andie over at Can You Stay For Dinner? To prepare the Big Mac Special Sauce for your dressing: Whisk the mayonnaise, sour cream, ketchup, water, vinegar, relish, onion, sugar, hot sauce, and teaspoon salt. Drink sauce. Set aside. To prepare the salad: Heat the oil in a large skillet over medium. Add the onion and saute for 2 minutes, stirring frequently. Add the ground beef and cook until browned, breaking up the meat with your spatula. Add in the garlic and stir until fragrant. Remove pan from heat and set aside. Assemble the romaine, tomatoes and cheese for your salad. Top with the warm beef mixture before dressing with 2 tablespoons Big Mac Special Sauce. Enjoy your deconstructed Big Mac and the resulting party in your mouth! For the dressing, use the full-fat mayonnaise & sour cream for best tasting results. Trust me, this is not the area you want to skimp. I recommend making the 4 serving, batch size dressing. Slather it on your burgers, dip things in it. Drink it from the jar. I’m not going to judge. When I buy a pound of ground beef, I always break the the meat up into 4, 1/4 pound patties. This makes preparing individual salads very easy and you always have burgers on hand. Get creative and substitute the ground beef for ground turkey, chopped veggie burgers or chicken. Add in some croutons if you’re missing the bread. This salad is very versatile. 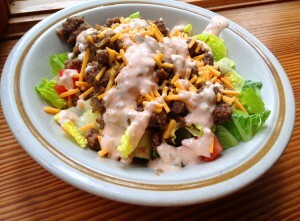 This entry was posted in Recipes and tagged Meat, Packed Lunch, Salad by chrystiewithay. Bookmark the permalink. I’ve had this so I can wholeheartedly say that it is GOOD!